The Ohio Valley Conference Board of Presidents have awarded the 2018 OVC Men’s and Women’s Basketball Championship to the Ford Center in Evansville, Indiana. The date of the 2018 OVC Basketball Championship is February 28 - March 3, 2018. “We are excited about the opportunity to take our flagship championship to another region of the OVC footprint,” said OVC Commissioner Beth DeBauche. “We look forward to the opportunity to partner with the City of Evansville and the Evansville Sports Corporation to provide an outstanding experience for our student-athletes and fans. “I additionally want to thank the OVC Board of Presidents for their time and thoughtful approach in reaching this decision,” DeBauche added. "I look forward to the OVC Championship being played in Evansville and at the Ford Center,” said Murray State President Dr. Robert O. Davies, who is the chair of the OVC Board of Presidents. “This facility is the ideal place to showcase our Conference and will be a memorable experience for our student-athletes. I also look forward to the emerging partnership with community of Evansville and know this will be an exciting event for the participants and spectators." The Ford Center, which opened in 2011, is a 10,000-seat arena located in the core of Evansville’s downtown district. The 290,000-square foot facility serves as home of the University of Evansville’s men’s and women’s basketball teams as well as the Evansville Thunderbolts of the Southern Professional Hockey League. 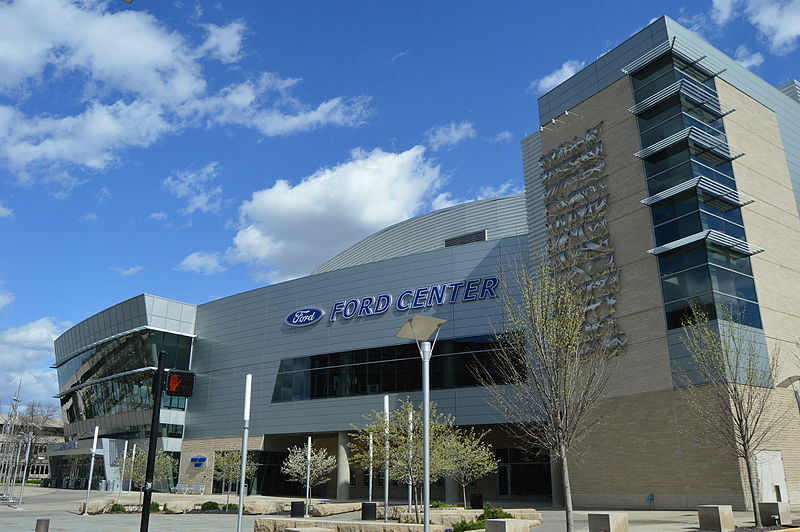 The Ford Center has serves as host to numerous sporting events and concerts on an annual basis. “Evansville is a basketball town and we could not be more excited to partner with the Ohio Valley Conference to deliver a championship atmosphere for OVC student-athletes and fans alike,” said Jason Sands, Executive Director of the Evansville Sports Corporation. Evansville is the third-largest city in the state of Indiana with a population of nearly 120,000 in the city limit and 300,000 people in the metropolitan area. "Our city has demonstrated on multiple occasions the ability to host great sporting events at every level,” said Evansville Mayor Lloyd Winnecke. “We gladly welcome the Ohio Valley Conference and look forward to showing their student-athletes the best experience possible,” he continued. The OVC Basketball Tournament is the fourth-oldest Division I Championship in the country; it will be held for the 54th time overall on March 1-4, 2017 at Municipal Auditorium in Nashville. That will mark the 23rd time in the past 24 years the event has taken place in Nashville. The last OVC Basketball Tournament held outside of Nashville took place in Louisville, Kentucky in 2002. The OVC will also partner with the Nashville Sports Council to serve as hosts of the 2018 NCAA Men’s Basketball Championship First and Second Rounds at Bridgestone Arena in 2018 (March 16-18). During the 2017-18 academic year, the OVC Board of Presidents will consider future tournament site locations.